The prevalence of Type II Diabetes has been increasing dramatically over the past decade. 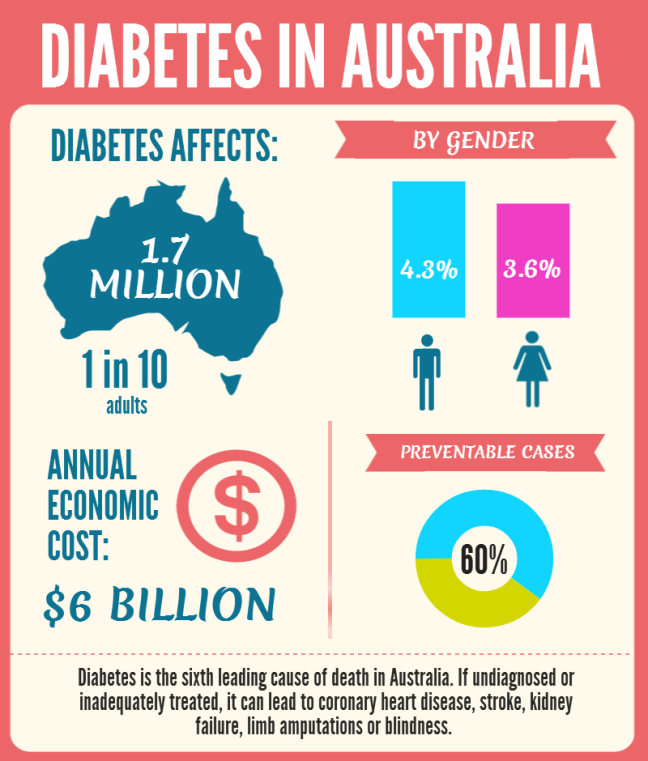 Currently there are approximately 1.7 million Australians living with Diabetes, 280 more people are diagnosed every day. Type II Diabetes accounts for approximately 85% of all cases, with a total healthcare cost of $14.6 billion every year (Diabetes Australia, 2017). This progressive metabolic condition has significant effects on the body’s ability to transform glucose from food into energy cells in the body due to insulin resistance or a decreased capacity to produce enough insulin in the pancreas. The occurrence of Type II Diabetes is associated with modifiable lifestyle risk factors including physical activity, diet, smoking, alcohol consumption, body weight and sleep, as well as genetic and family related risk factors. Although there is currently no current cure for Diabetes, Type II diabetes can be managed with lifestyle modifications. Physical activity and diet modification are currently the main forms of managing Type II Diabetes (ACSM/American Diabetes Association, 2010). There are many benefits of exercising with Type II Diabetes, including improved glycaemic control, body composition, cardiovascular fitness, physical functioning, general health and wellbeing as well as decreasing an individual’s cardiovascular risk factors. Unfortunately, despite physical activity being one of the main forms of treatment for Type II Diabetes, from experience most individuals with this condition are not meeting the current exercise guidelines. The current recommendations are; an accumulation of 210 minutes of moderate intensity aerobic exercise or 125 minutes of vigorous intensity aerobic exercise as well as resistance training two or more times per week (non-consecutive days). Some people may already be completing incidental or cardiovascular exercise in their day to day lives (walking the dog, gardening, household chores, swimming), however most people are not meeting the resistance training recommended exercise guidelines or enough aerobic exercise in their current day to day lives. Specific resistance training exercises are highly beneficial in the treatment and maintenance of Type II Diabetes as skeletal muscle is responsible for ~80% of insulin-mediated glucose uptake. The skeletal muscle of individuals with Type II Diabetes exhibits a decreased capacity to oxidize both glucose and fat. 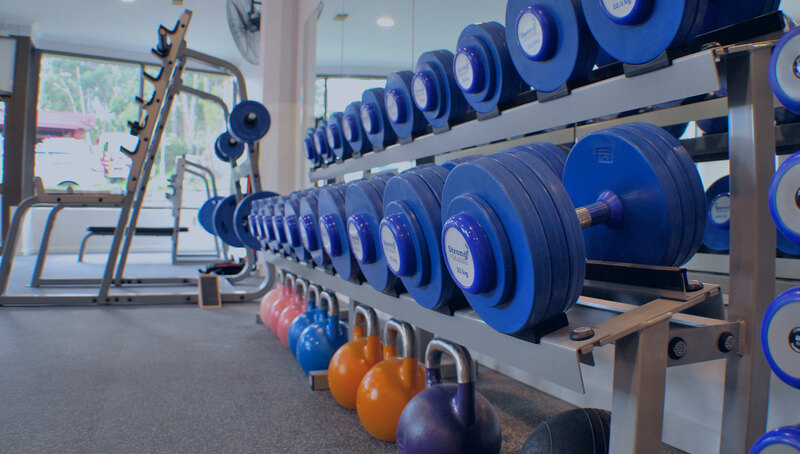 Resistance training can result in an increase in muscle efficiency, mass and strength, with these increases typically associated improvements in glucose and fat metabolism can be observed. It has also been established that the completion of resistance training over an extended period can also enhance oxidization of fatty acids. One single bout of resistance training can lower fasting blood glucose for up to 24hours post session. The inclusion of resistance training in the treatment of Type II Diabetes can establish better blood glucose levels through the development of lean and efficient muscles. A combination of both resistance and cardiovascular training can be more effective in lowering blood glucose levels and increasing blood glucose control than either modality alone. If you have recently been diagnosed or currently managing Type II Diabetes and are interested in learning more about how exercise can help manage your Diabetes and develop a suitable exercise program, contact Strong & Stable on 9762 0976 or info@strongandstable.com.au. management methods and altering my lifestyle have helped. it to FB. Quality stuff! let it get me down – things like alternative management methods and gluten-free dieting have helped. Anyway, I hope this article gets more commenters and I’m sharing it to social media. Thanks for sharing your knowledge on diabetes, reading your blog will make people more aware of how important It is to add exercise into our day, modifying our diet & generally take care of our bodies to prevent this disease. put things into a different light rather than just restating what I already know. helped. Anyway, I hope this guide gets more commenters and I’m sharing it to my social media.